I was lucky enough to first see Paul McCartney in concert in 2009, and it remains one my most favorite concert experiences. Tuesday’s show at UVA’s John Paul Jones Arena afforded me the unique opportunity to see McCartney in a much smaller setting. After seeing his appearance on the SNL 40th Anniversary Special in February, I had some minor reservations, wondering if he could still sing the songs I love as well as he did when I saw him six years earlier, but once the date for the show at JPJ Arena was announced, those reservations disappeared with the knowledge that every tour could be Paul’s last tour; so I quickly snapped up a single ticket on the floor of the arena. Okay, first things first, the man just turned seventy-three on Thursday (June 18) and yet he’s still putting on shows that include forty songs and have a running time of about two hours and forty-five minutes! There were a few moments where the voice sounded very thin and unsure, most notably on the verses of ‘Maybe I’m Amazed’, but for the most part he sounded great, and while the song selections were very similar to the show I saw in 2009, there was enough variation to keep it very entertaining. One of the biggest surprises was how well the song ‘Queenie Eye’ from his latest record ‘New’ translates to the stage. Granted, with such a well known back catalog of Beatles and Wings songs, playing any new song is going to irritate some fans, and when “Queenie Eye” began, a lot of fans did head toward the concourse for a bit, but I really enjoyed the energy and the call and response of the chorus. It was a very surprising highlight. 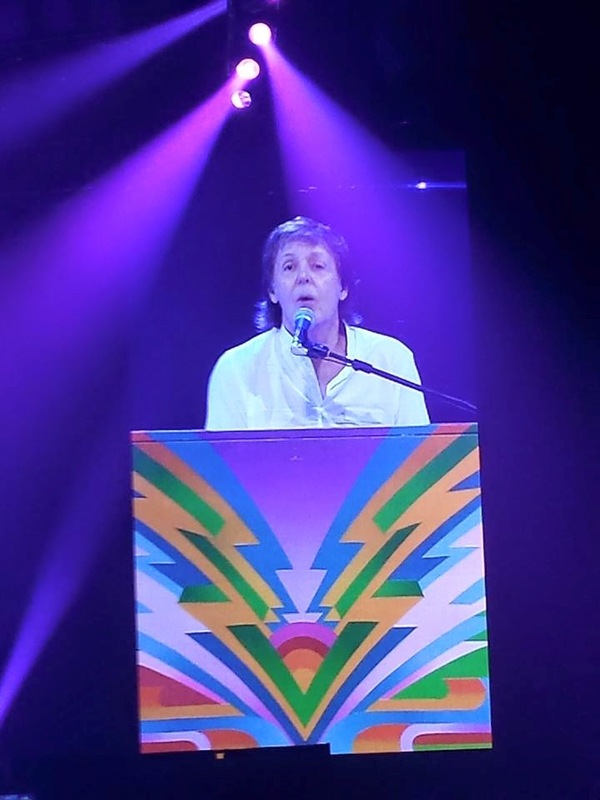 Perhaps the only misstep in the set was the inclusion of “Temporary Secretary”, a song from 1980 that is truly unlike anything else McCartney has ever done. I knew it would be in the set, but I wasn’t looking forward to it, and its placement in between The Beatles’ classic ‘One After 909’ and the Wings’ concert staple ‘Let Me Roll It’ made its appearance even more of a head-scratcher. The song I looked forward to the most when I saw a set list from the Australian leg of the tour was “Another Day.” It remains my favorite post-Beatles lyric of his career. I can’t really explain why, it just has always been my favorite and I never though I’d hear it in concert, so my night was made when he played that. As expected, Paul sang “Here Today’ in tribute to John and “Something” in tribute to George. Before “Maybe I’m Amazed” he said ‘I wrote this one for Linda,’ but I was affected by a more understated tribute to his late wife: During “Band On The &nbsp Run,” the screen behind the band showed archival film from the 1975 album cover photo shoot. Seeing a young Paul and Linda posing and smiling with their mates really made me very emotional. It hit me in such a way that I found myself almost ignoring what was happening on stage in order to concentrate on the video footage to watch Linda and Paul onscreen together. Sadly, that simply wasn’t possible back then, but seeing McCartney on stage is probably the next best thing. Extra special thanks to my dear friend and McCartney fanatic Dana for attending this show with me. It was a pleasure as always.